GM Salo Flohr, one of the world’s best chessplayers between two Wars and a world title candidate, would celebrate his 100th birthday these weeks. He spent his best years in Prague, and therefore the city and the Prague Chess Society organized a rapid tournament and a party to his commemoration. The playing venue was Hotel Best Western Kampa, which already hosted Kramnik – Navara match earlier this year. 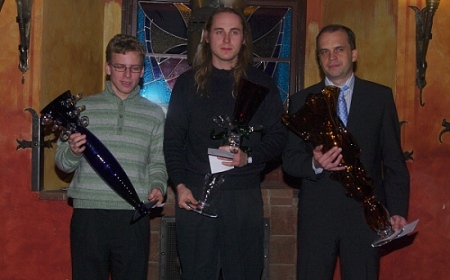 Three best chess players of the Czech republic – GM Navara, GM Hracek and GM Laznicka – together with another 6 GMs and 7 IMs, were invited to take participation. Players who personally knew Flohr are also included – e.g. GM Vlastimil Hort and the writer Vlastimil Houška. The tournament was played as a 7 round Swiss, with time control of 15 minutes + 15 sec per move. 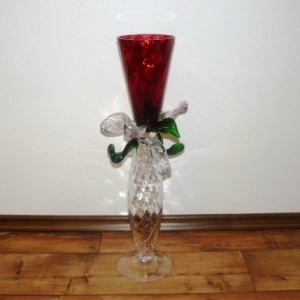 The prize fund was 77.000 Kč (almost €3.000) and the winners were awarded with glass vases designed by Bořek Šípek and Jiří Pačínek. The young GM Robert Cvek finished on the top with 6.0 points, half a point clear ahead of GM Viktor Laznicka and GM Zbynek Hracek.